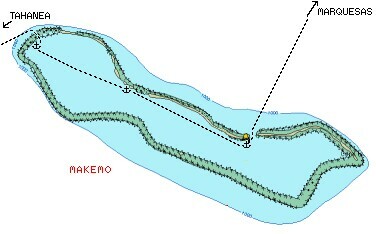 Makemo Atoll, showing our 3 anchorages. We last left you with the wind howling and Ocelot hanging from a bollard on the Makemo dock. We stayed there for several days, making friends with the small French catamaran next to us and walking around the village. All of French Polynesia is dancing for July in preparation for Bastille day (14 July) and French President Jacque Chirac's visit. The night after we arrived we just missed the women dancing at the little village, but we were told the men would be dancing the next night. So we were ready and waiting at 7:30, expecting some good, rousing, energetic, manly, Haka war dances. No. Instead we get a group of boys dancing with paddles (OK, in a grade-school kind of way) and then some ... 'people of indeterminate gender' doing imitations of the women's dancing. It would have been funny if it was a spoof on the women, but I think they were actually transvestites (or possibly even trans-sexuals) trying to imitate the women. OK ... interesting if you're into that sort of thing but not really what we were expecting. Men just can't do that kind of dancing as gracefully as women can. Apparently, there is quite a colony of these people here. They tend to be the youngest sons of large families, and they're often raised as girls for some reason, which must really mess up their personal sexual identities. We left the next day, with Sue and Amanda on the bows to watch for bommies that poke up to the surface from 70' (20+m). It would have been an easy sail except that it was still blowing 20-25 knots and we kept having squalls come through, messing up visibility and getting us wet. After about 2 hours of dodging coral heads we finally got to our anchorage, just as a massive squall arrived as well. By the time we got the hook settled in we were all thoroughly soaked and freezing (temperature is down to, like, 75°F or 24°C now!) so Amanda whipped up some toasted cheese sandwiches with a delightful spicy tomato soup - shades of Seattle lunches! One good part of the day is that we caught not 1, not 2, but 3 huge fish! These yielded something like 20 lbs (9 kg) of boneless fillets. So we hosted a pot-luck with the other 4 boats there, feeding them fish and letting them feed us everything else. Click here to go to the Makemo Destinations page.